Ariana Grande’s “thank u, next” video is a spectacle worthy of the chart-topping anthem. The 25-year-old has been teasing the Hannah Lux Davis-directed release with a series of posts on social media. As a result, anticipation has been sky-high. Arriving today, the final product pulls off an impressive feat: referencing four cult-classic films – Mean Girls, Legally Blonde, 13 Going On 30 and Bring It On – in just over five minutes. It also boasts a truly star-studded cast featuring appearances from the likes of Troye Sivan, Colleen Ballinger, Jennifer Coolidge, Jonathan Bennett and Kris Jenner. 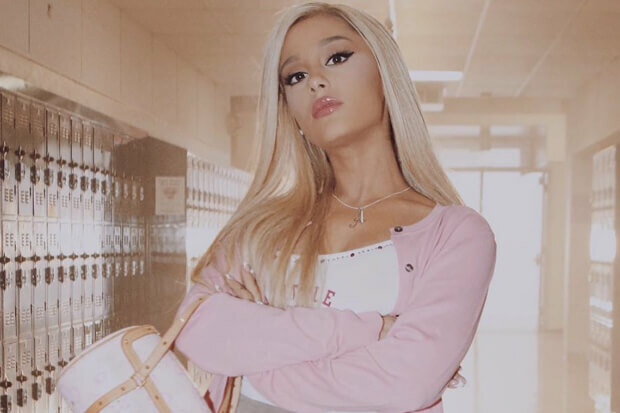 Opening with a montage lifted from Mean Girls, the “breathin” diva assumes the role of Regina George and plays HBIC in a high school setting. Later she and the rest of The Plastics take the stage in Christmas costumes for a performance. Ari makes sure to build in references to iconic moments from each of the movies. There are epic cheer-offs, doll houses and, most importantly, the Bend & Snap. Meeting up with Coolidge, the pint-sized pop princess makes some size jokes before breaking into Elle Wood’s signature move. I stan. The amount of effort that went into recreating the scenes is commendable, but it is also worth noting just how much they have been modernized. Each character has been built around the Sweetener siren, and she plays them so well. I wouldn’t be remotely surprised to see the visual go mega-viral. If it does, it is safe to assume that “thank u, next” will stay at the top of the Billboard Hot 100 for weeks to come. Press play on the video below to see Ari in action. When you do, make sure to watch until the very last seconds or else you’ll miss Kris closing things out. What is your favorite part of the video? Let us know below, or by hitting us up on Facebook and Twitter!